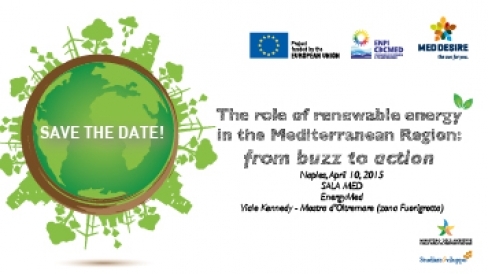 The event “The role of the renewable energy sources in the Mediterranean Region: from buzz to action”, promoted by the Italian Ministry for the Environment, Land and Sea within the project MED-DESIRE, will be held during EnergyMED 2015 next April the 10th. The initiative is finalized to introduce to the private and public stakeholders the most recent financial, technological and regulatory developments on the renewable energy and energy efficiency issues underlining the opportunity and the barriers. The event is addressed to stakeholders and business sector and will include contributions of Institutional Representatives: Puglia Region, Italian Ministry of Environment, Land and Sea, Tunisian National Agency for Energy Conservation (ANME); International actors: UNEP-DTIE; Scientific and Technical Experts: CIEMAT PSA - Center of Energetic, Environmental and Technological Solar Platform of Almenia, ENEA, Politecnico of Milano; Stakeholders: Regional Center for Renewable Energy and Energy Efficiency (RECREEE), Solar Energy Development Association (SEDA, Egypt); from Egypt, Lebanon, Tunisia and Italy.